Three faces of the Moon are shown above at approximately the same size and orientation. All images show a Full Moon, but the colorations differ dramatically. On the left is your typical Full Moon, appearing mainly in shades of gray. The middle image shows a Full Moon rising, just above the horizon. Its distinct orange hue is caused by the scattering of shorter wavelength light (violet/blue/green) by Earth’s atmosphere. 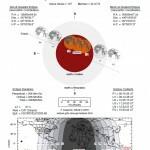 At right is an image of a total lunar eclipse. Assuming you’re anywhere on the lucky side of Earth, a total lunar eclipse happens near midnight, when the Moon is high in the sky and easily seen. Like the rising/setting Moon, it’s orange-red color is caused by scattering. But during an eclipse, refraction also happens. Refraction bends sunlight through Earth’s atmosphere into its shadow. The eclipsed Moon’s color is caused by the combined light of all the sunsets and sunrises occurring around Earth’s perimeter (as seen from the Moon). Check out this excellent NASA animation of an eclipse from the Moon’s point of view. What you’ll see on October 8 is difficult to predict. Every lunar eclipse is unique, depending on just where through Earth’s shadow the Moon passes. In the image above, the umbra (darkest part of the shadow) is near the top of the Moon. During the October 8 eclipse, the umbra will be at the bottom (as seen from a northern hemisphere perspective). Various colors can appear, depending on the cloud cover around Earth’s perimeter. The Moon could be anything from bright orange to brick red. Rarely, when the clouds are thick and opaque, the Moon goes completely dark. Whatever surprises this eclipse brings, East Asia (and Australia) and western parts of North America will have the best view. The thumbnail below shows the Moon’s detailed path through Earth’s shadow. Click to enlarge. You’ll notice that all the event times are given in UT (Universal Time). To convert UT to your local (clock) time, use our handy Local to UTC converter. It’ll read the system time on your computer to make the conversion, so be sure your system time is up to date. If your OS doesn’t update your system time automatically, you can use any of several free apps that will sync your system to the global network of atomic clocks. I use WebTime by Gregory Braun. Total lunar eclipses are called “Blood Moons” in folklore and mythology, with the usual superstitions attached. The Moon’s appearance is indeed striking. Not only is it an unusual shade of orange-red, it also looks more 3-dimensional with the gradient of brightness from umbra to penumbra — like it’s being lit by a red bulb from the side. A friend of mine described it as “looking like a basketball hanging right in front of me, and close enough to grab.” By comparison, the rising/setting Moon is uniformly orange-tinted and appears more 2-dimensional. 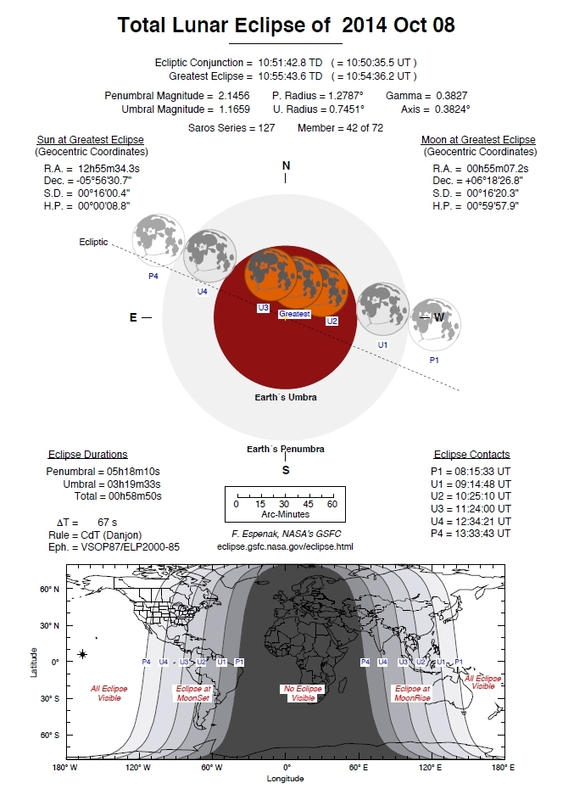 If you need some help visualizing how the Moon can pass through Earth’s shadow, take a look at this animation from my April 14, 2014 post, the date of the previous total lunar eclipse. On average, for any given location on Earth, there is one total lunar eclipse every 2.5 years. In 2014 there are two. Likewise in 2015. This cluster of four eclipses in two years (known as a tetrad) is not that rare. Eight more tetrads will occur before the year 2100. Finally, I’d like to say something about the discussion regarding this current tetrad as fulfilling a biblical prophecy, and being an omen of bad things to come for the nation of Israel. There is some debate among both Christian and Jewish scholars on both sides of the fence. But the fact remains: Tetrads are a natural and recurrent phenomenon. They’ve been happening for millennia, and will continue to happen for millennia to come.